Recent national media coverage on Construction Innovations Sustainable Subdivisions: Energy Efficient Design research project highlights the considerable impact this project continues to have. The industry report for this project also forms part of first year university curriculum for Built Environment and Engineering students at QUT. It is one of four mandatory reference sources for approximately 1400 students undertaking the BEB100 Introducing Professional Learning course. 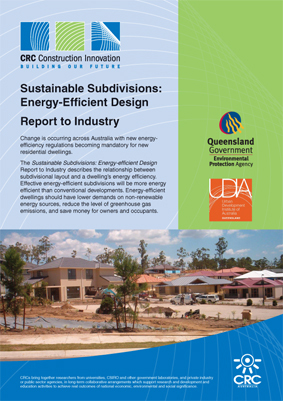 The reports co-authorAnne Miller, a researcher with CSIRO Sustainable Ecosystems, is due to complete a second Construction Innovation Sustainable Subdivision industry report that aims to verify and quantify the role natural ventilation has in cooling residences in sub-tropical climates and inform the development of a lot-rating methodology for south-east Queensland. The research may also make a recommendation that the existing lot-rating methodology in use in other parts of Australia.